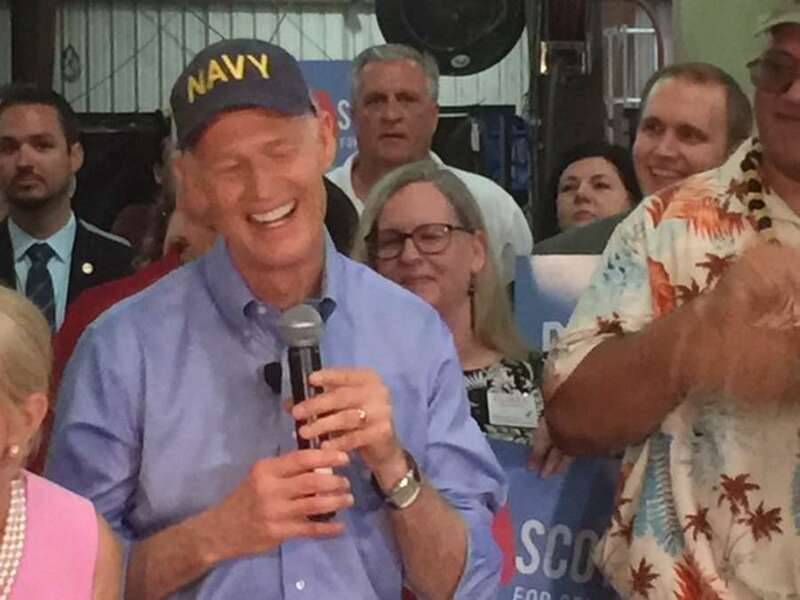 SICK RICK SCOTT has "a blind trust with 20/20 vision," in the immortal words of Jim Sasser about then-Senator WILLIAM E. BROCK, III in the 1976 U.S. Senate race in Tennessee. Jim Sasser defeated BROCK in a populist campaign, in which people sported buttons and bumper stickers stating, "I paid more taxes than Bill Brock." To Florida U.S. Senator Nelson, you MUST defeat this rich bloviating bully. Rick Scott had a good year. His net worth jumped by $83 millon. Scott's financial disclosure form, filed late Friday, showed that his net worth was more than $232 million at the end of 2017, a 55 percent increase from the previous year. Florida Gov. Rick Scott had a very good year in 2017, as he saw his net worth increase by more than $83 million, a surge in his millionaire status as he launched a campaign for U.S. Senate. Scott, a Republican and former businessman who is termed out of office this year, filed his annual financial disclosure form Friday. It showed that his net worth was more than $232 million at the end of 2017, a 55 percent increase from the previous year. Scott, a former hospital executive, has maintained most of his assets in the Gov. Richard L. Scott 2014 Qualified Blind Trust, which likely saw a surge in profits as the result of the sale of a Michigan-based plastics company in which the governor's firm was reportedly a principal owner. The law allows public officials to create a blind trust in lieu of revealing their assets on a financial disclosure form. But by shielding the investments from the governor's direct control, it also shields from the public any information about how the governor increased his wealth. As a candidate for Congress, Scott has until the end of July to disclose all his family's assets, including those held by his wife — a broader disclosure requirement than Florida requires. The governor's blind trust is managed by a third party — a company that includes the governor's former personal adviser. The governor reported that in 2017 his blind trust ballooned in value from $130 million to $215 million. The governor's reported investment income from the trust rocketed from $4.3 million in 2016 to $120 million in 2017. Florida law does not require Scott to report what was done with the income from the trust. The governor does not take a salary from the state. Questions have followed Scott since he first created the blind trust when he was elected in 2010. When Scott ran for reelection in 2014, he briefly dissolved his first trust and released information about the individual holdings in it. He also released his tax returns for 2013. The tax returns showed that the Scott family earns millions more than the governor reported individually on his financial disclosure form. It also raised questions about whether Scott may have control over assets held by his wife, Ann Scott. An investigation by the Times/Herald into those investments found that filings with the Securities and Exchange Commission indicated that the governor had substantially larger holdings in several companies than what he reported to the state. A lawsuit was filed by George Sheldon, a 2014 Democrat candidate for attorney general, but a court ruled that the governor could not be compelled to disclose more information. Tallahassee attorney Jim Apthorp appealed the decision, arguing that the blind trust law violated the constitutional provisions of the state's public records law, but the Florida Supreme Court rejected that argument in 2015. Both Scott and his wife maintain the blind trust. Florida law does not require spouses of elected officials to reveal their financial holdings. The governor's 2017 disclosure shows that he reported the value of his home in Naples dropped from $15 million to $14 million, but he saw a $3,000 increase in the value of an adjacent $147,000 boathouse. For the fourth year in a row, Scott listed his 60-acre Montana residence at the same value he has listed it before: $1,498,459. The governor's IRA through Pershing Advisor Solutions increased in value by more than $66,000 to $637,946. His Wells Fargo bank account was down $3,500 from 2016 to $48,717, and his Mutual of Omaha bank account was down by more than $45,000 to $45,744.